Enjoyed walking little O across cold, windy fields and felt better for the jaunt. Had a quick cuppa with Zillah, O’s owner, then went home. A huge van was blocking our driveway, but I was glad to see it because it meant the plumber had turned up, and was dealing with the drainage problem. After some panicked activity, we paid the helpful chap, who had dreadlocks down to his waist and settled down at the computer to do some blogging work. We were relieved the drainage problem was sorted. Having received the happy news from dreadlock plumber, we decided to venture out to celebrate Valentine’s Day and clear, clean drains. Such is life. 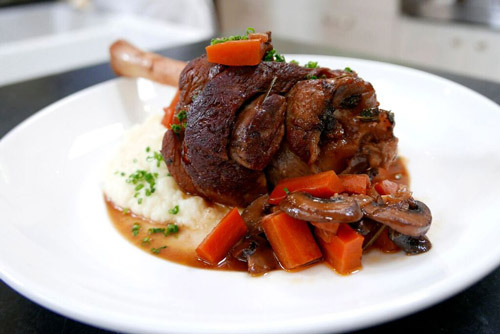 The jolly couple (us) had lamb shank in a yummy red wine gravy, mash potatoes plus veg. We were then pursuaded into having a chocolate pudding which arrived with two dollops of ice cream. The chocolate pud was in the shape of a heart which amused the waiter. Who says romance is dead? Great day but I do feel rather full now.